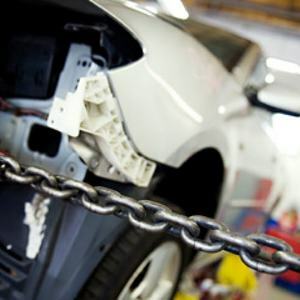 What is Auto Body Repair All About? Making sure the customer has a comfortable experience with Collex in all aspects of our auto body services. Many people in the industry use the phrase “pre-accident condition” to describe the way a vehicle should leave an auto body facility following repairs. In other words, the vehicle should look, ride and perform the same way it did before the damage took place. What goes into that repair can be a significant amount of both skilled labor and parts, and, because of that, a fair amount of cost. The following information details the different aspects of our work at Collex and what goes into repairing a vehicle that has been damaged. Again, we pride our company and ourselves on our ability to help the person through the accident procedure as well – making sure the customer is as comfortable as possible: informed, confident in our abilities, and ultimately happy with us having met our commitments in a timely manner. Visit our Testimonials page to see what our customers are saying about our work and commitment to customer service. 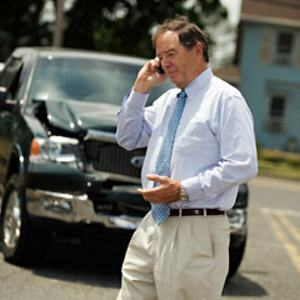 What happens to your car when you get in an accident? Today’s automobile designs reflect not only style and looks, but exceptional improvements in passenger safety as well. Although many people become concerned with the extent of the damage to their vehicle, what is important to understand is that much of the damage is done by design: the buckling and crumpling of certain parts on a vehicle show the energy being absorbed by the car instead of the people absorbing the impact. In older designs made with a large, stiff frame, although the vehicle itself may not have shown much damage, the person or people inside absorbed most of the energy created by a collision. A good analogy is something a lot of us may have done as a child. Think of yourself or some children jumping down off a tree or a fence. We are able to bend and flex our knees when landing, absorbing the energy created by coming into contact with the hard ground. Now picture that same jump, but while landing, you keep your knees in a locked position. Jarring to say the least! Like our knees and muscles absorbing the shock of impact while landing, modern vehicles have “crush zones” and ways in which the vehicle absorbs the impact and sends this energy around the car and away from the people inside. Additional safety comes from anti-lock brakes, airbags, seat belts and other means, but the actual structure of the car plays a major role in saving lives and preventing far more serious injuries. Now to auto body repair and the work our team at Collex performs day in, day out. 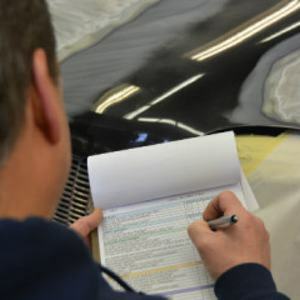 The collision repair process starts with the estimate. At Collex, an estimate is our opportunity to listen and understand how we can help you – we work with you to understand how the accident happened, listen for any special needs, and learn what kind of advise or support you might need in working with your insurance company. During the time we spend together, a Collex estimator will review your vehicle with you and develop an estimate of the repairs necessary for your vehicle. This will include the parts and labor required to fix your car properly. We use a computerized estimating system that allows us to generate your estimate quickly, accurately and legibly. We’ll print your report on the spot and review the report with you, careful to explain exactly how we will repair your vehicle. At this point our estimator will also be able to let you know how long the repair will take. Our customers often have many good questions. Again, we like to use this time to answer any questions you might have concerning the auto body repair itself, insurance related issues, questions of a police report, rental car coverage, or any other issues that come to mind. With your understanding of the repair process and your choice to have Collex Collision Experts perform the work, the next step would be to schedule your repair at a time convenient for you! Before you drop off your vehicle for auto body repair, a great deal of work is already done. Parts are ordered, parts are received and our Parts Manager matches the new parts to your car based on photos in our computer system. Our Customer Service Reps handle any administrative issues such as proactively calling the insurance company to make sure everything is in order; making a rental car reservation as necessary, confirming parts deliveries and handling any questions you might have. One of our Customer Service Reps will call you two days before your scheduled appointment to confirm the repair. You can drop off the car the morning of the auto body repair or the CSR can describe our night drop procedure – which ever is more convenient for you. We’ll know if a rental car is involved and will call to have them come pick you up at our site. As our rental partner is a ½ mile away, it is a very quick transition and you’ll be off with your day. Before you leave us, we will review the delivery date and any special requests you might have. The first activity is to take apart the damaged area of the vehicle to clean the workspace and finalize our understanding of the repair. 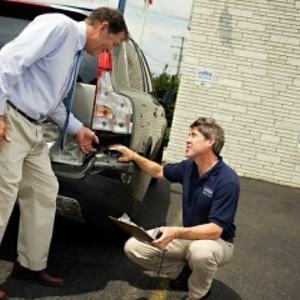 A production manager reviews the initial estimate, double checks parts and records any additional repairs necessary – it is not uncommon to discover additional damages in this phase – many parts that may have been damaged during an accident cannot be accessed or visible during the initial estimate or inspection. If you were not using an insurance company and paying our of pocket, our estimators are very careful to be thorough and accurate with their initial estimate and avoid any additional charges. For insurance claims, additional damage is customary and a supplement is created. These changes are quickly communicated through our processes and computer systems and any additional parts are ordered immediately – we work very hard to make sure nothing causes a delay to your delivery date. If required, a technician will perform frame repair. The term “framework” comes from work required to properly repair the frame or structural components of your car. Years ago, all cars were built with an independent frame with a separate body that was bolted on to the frame. Today, most cars are made of “unibody” construction. Unibody refers to the many sheetmetal parts that are welded together to form a single unit. For strength, structural integrity and passenger safety, some of the parts within a unibody design play a more significant part and are called “structural parts”. These parts are designed and manufactured to manage the energy generated in a collision and are therefore built with specific points of increased rigidity or alternately, collapse zones. Whether working on a frame vehicle or unibody design, Collex technicians need to insure that the structural components are brought back to their proper dimensions and shape. At Collex, we use state-of-the-art Car-o-liner frame straightening and laser measuring equipment to improve the auto body repair process. Once on one of our two machines, the car is anchored by clamping the underside of the vehicle, and the necessary pulling and straightening can then take place with the use of hydraulics. Following frame repair, our technicians at Collex are ready to replace and/or repair the additional damage. Here is where a technician’s work is largely both an art and a discipline toward doing things right. In replacing parts, it is more an application of discipline. There are procedures that need to be followed to replace parts properly. Most people picture replacing a part in the simplest light: a fender, a headlamp, or a hood. Even these parts require disassembling associated pieces as well as careful handling to insure no nicks or scratches. Still though, a headlamp for example, is singular and self-contained. Often times, what needs to be replaced are sections of the unibody or structural parts. Again, our technicians need to follow disciplined rules. For example, a typical repair might require a technician to remove original spot welds, section (or cut) structural parts in the right place, apply corrosion protection, use mig and/or spot welders and proper techniques to successfully join metal together, and seal joints and seams to prevent moisture, fumes and noise from entering the passenger compartment. Aligning the replacement parts takes place during this period of the auto body repair process. 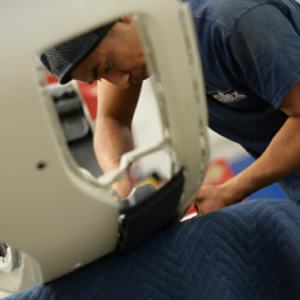 From the initial frame work to replacing structural parts – all of this must be done to extremely close specifications: when it is time to align the outer sheet metal (fender, door, quarter panel, hood, decklid) an excellent job earlier in the process makes this a matter of small adjustment. Space between panels should be consistent and the same as the opposite side; running one’s hand along the side of a vehicle should reveal no unevenness. If damage to a vehicle is not sufficient to warrant the replacement of the part, the part will instead be repaired. Here a Collex technician uses a higher degree of artistry to pull, hammer and tap a part back to its original shape and then finish the work by applying coats of body filler to shape to its true lines and contours. The sanding and feathering of this plastic is critical to the smoothness and final finish. A minor imperfection that could go unnoticed before the vehicle is painted can easily stick out like a sore thumb when that part of the vehicle is refinished. OK, bodywork done, then you paint it. Right? Is that with a roller or a brush? Well, not so fast. Actually, the paint is applied with a spray gun (HVLP, or high volume – low pressure), but the application of paint is probably the easiest part. Preparing the surfaces for refinishing is absolutely, positively critical. Clean and smooth, smooth and clean – a good paint department’s mantra. Keeping a surface clean during the collision repair process is a must. Collex’s paint department uses the proper wax and grease removers, solvents and cleansers to keep the portions of the vehicle to be painted clean throughout the entire process. Even during the many phases of sanding, a surface is cleaned before and after. For the “smooth” mentioned above, this requires sanding – and several iterations of sanding. Our technicians sand with a machine, with a block or by hand. Each type of sanding is followed by a finer grade of sandpaper to get the surface to the desired, jewelers smoothness. For brand new parts with bare metal or plastic, or for areas that have had bodywork performed on them, the surface will require coats of a primer-surfacer, an initial layer of paint that helps seal the surface and offers an excellent means for smoothing out the panel. Once the primer is dry, the area will need to be sanded again. Although this portion of the repair process is labor intensive and time consuming, it really is critical: as our technicians proceed through this process, potential problems can be more readily identified. Again, the focus is clean and smooth. Overspray, or paint that has made its way to other parts of the car, is unacceptable. To make sure this doesn’t happen, paper is taped and applied to the vehicle to prevent the tiny air-borne particles of paint from going anywhere other than on the surface it is intended for. Once the prep work is complete, the vehicle or parts to be sprayed are brought into one of our two paint booths for the next phase of repair: the application of color and clear coat. We mentioned above the use of our two paint booths. A paint booth is an enclosed and controlled environment that allows our painters to apply paint with less worry of contaminants. Both booths are equipped with blowers and heaters, which aid in the curing and drying of the different layers of paint. Similarly, each booth has a series of filters that capture both dirt and contaminants that might try to make their way in, and excess spray or emissions that could possibly escape and potentially harm the environment. To help color, especially from dark to light or light to dark, a sealer is tinted to help build up the proper base color. After the sealer has been applied, the basecoat, or actual color, is next. At Collex, we use a computerized paint mixing system, training and experience to get our exacting color matches. Whether Ford, Lexus, VW, Hyundai, Mercedes or any other type of vehicle, we have a database of color formulations that is made to match. There are instances where one of our painters will need to tint a formula a fraction to make the proper match. Along with color, other agents such as hardeners or flex additives are added. For example, flex additive is what allows a car bumper to compress or bend from a light impact and not crack. With the correct color mixed, the painter will do a final wash and tack of the vehicle. With white jump suit and mask on, a Collex painter will then plug their spray gun into one of the air hoses supplied in a booth and apply the color. Again, depending on the situation, the basecoat may require anywhere from two to three layers, or coats of paint. After the actual color has been applied, a layer of clear coat is necessary. The clear coat is a protective and beautifying layer – it helps prevent the sun and elements from damaging the color and finish of the vehicle as well as giving it that “wet”, glossy look. Again, depending on the application, this phase of refinishing will require two to three coats of clear. After applying the final layer of clear, our painter will set the booth for the proper time and temperature and “bake” the finish onto the car and speed the curing process. After paint, a repair returns to our body technicians for the careful assembling of the vehicle. Assembly refers to putting the pieces back together – door handle back in the door; moldings back onto the fender, door or quarter panel; headlamp or tail lamp reinstalled; hood ornament or windshield washer nozzles back in the hood… And so on. In some instances, parts of a vehicle are painted off the car and need to be reinstalled. For example, a new bumper might have been painted separately and needs to be installed on a vehicle. To assemble the bumper, not only does a technician need to attach the bumper to the car, but the original lights, moldings and/or license plate from the original bumper must be swapped onto the new. Still in other instances, interiors are usually left disassembled until after refinishing, so carpets, seats and interior trim work need to be reinstalled. Depending on the severity of the repair, this can still be a substantial amount of work. After assembly, if there are any mechanical or system oriented repairs that have still not been completed, they get attended to. As a few examples, this is when any wheel alignment, A/C recharging or fluids that need to be topped off would be completed. Similarly, depending on the repair, the technician may wish to take the vehicle for a test drive or test certain aspects of the car’s performance. At Collex we believe a properly repaired vehicle has everything to do with quality throughout the entire process. Because of this, we have inter-departmental quality check points: a vehicle will not proceed to the next phase of repair before the technician and production manager perform a standardized review. Every car we repair at Collex is buffed, cleaned and washed for customer pick up.